If you’re planning a festival wedding look no further! We have pulled together our checklist to offer inspiration for the perfect relaxed, natural festival style wedding. Festival weddings are hugely popular in the UK and officially a ‘thing’. The personality of the couple can really shine through and guests absolutely love the relaxed, informal vibe. Think live music, drinks and games in the sun, surrounded by beautiful scenery and then hog roasts and toasty firepits at night! You can exchange your vows outdoors too, meaning you can enjoy the setting to the fullest on your special day. The best part about organizing a festival wedding is that the party can be stretched over the whole weekend, with guests camping on site. First things first – spread the word! Set the tone, starting with the invitations where you have so many fun options – remember this is your chance to sow the seeds and create excitement about your big day! The invitation needs to contain as much information as possible (timings, camping options). 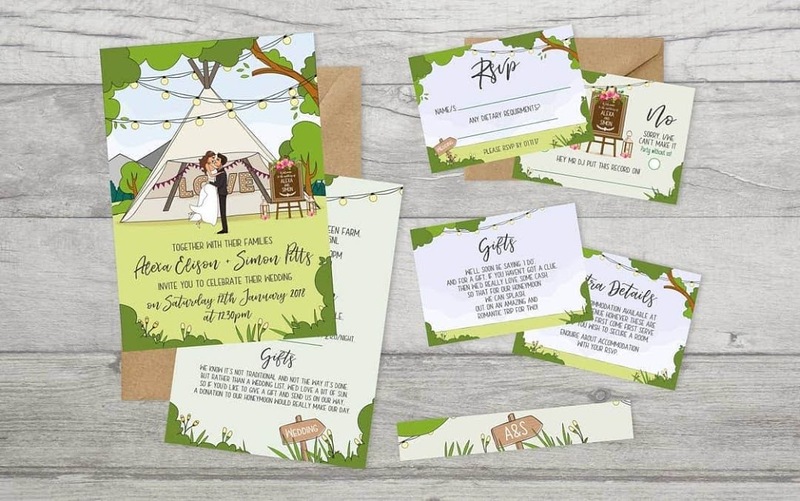 We’ve seen some lovely alternatives to your traditional invite from lanyards to mini tipi models and wristbands detailing the ‘line up’ of events. Take a look at Georgia Yates Wedding Stationary for inspiration! Forewarn your guests by giving them a checklist of what to bring and wear. This will allow everyone to be prepared for all weather-eventualities. Layers, footwear, (wellies) etc. Transport options and accommodation essentials should be included too. The Venue – the best parties happen under canvas! With fingers and toes crossed, your festival wedding will be outside in glorious sunshine. However, should the heavens decide to open on your wedding day, your tipis will keep you and your guests perfectly dry and provide plenty of space to eat, party and be merry, whilst creating a cosy, intimate vibe. 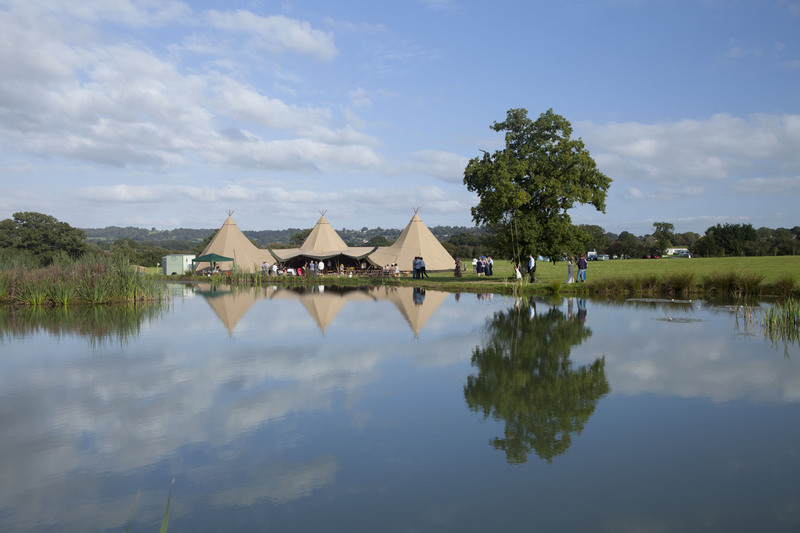 We are more than happy to plan your wedding at our own stunning lakeside venue or can bring our tipis to you if needed. When planning your festival wedding there’s no rule book. You and your partner can really express your personalities with the fine detail – there are very few rules or boundaries here! Music is certainly the key to a good festival wedding. Get the Glastonbury vibe by selecting a live band (or two!) instead of a DJ and don’t forget to add your favourites to the playlist. You could even ask your guests to share their favourite tracks on their rsvps! Get creative with your styling! Make sure you have the budget set aside for decorations and styling. You can get creative and have some fun making signage for the big day – you’ll need to include everything from the ‘main stage’ to ‘outdoor games’, and of course not forgetting a board for the days itinerary! Reflect the beauty of your venue setting and create a laid-back atmosphere through your decor. Think colour, fun and most importantly be unique – bunting, lighting, paper lanterns, ribbons, florals and rustic touches. Our fabulous local florists, Chew Florists have some great inspiration and can create anything floral from wellie flower pots and flower crowns, to name a few – all beautiful festival additions! 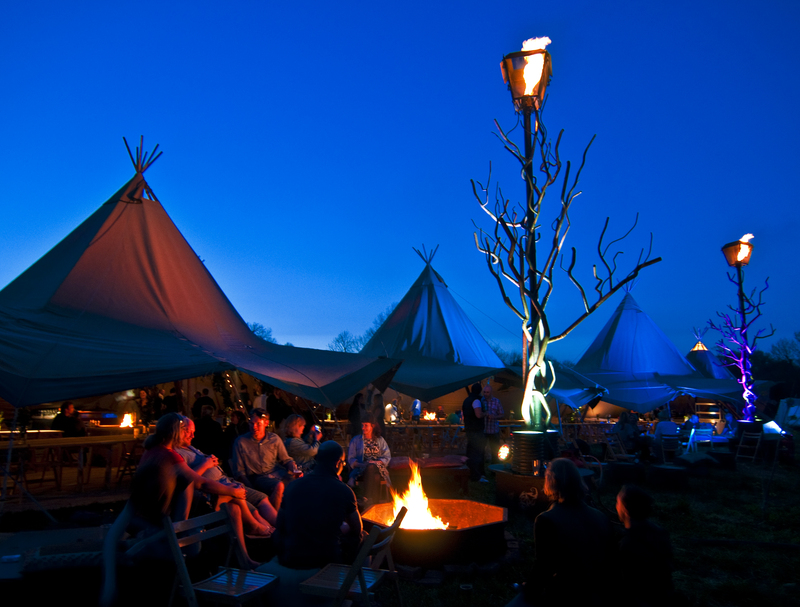 Lighting and ambience should be ‘just so’ – popular with our couples are campfires, candles, glowsticks and sparklers. You can choose how formal or informal you want your wedding to be but a combination of seating will be necessary to cater for the meal and the before/after party – deckchairs, cushions, hay bales create a good chill out area for guests to relax and enjoy the party! There’s nothing quite like a hog roast and it’s the perfect pairing for a festival wedding, especially as an add-on during the evening to refuel your guests! You may also consider a buffet style meal which works brilliantly when catering for a range of dietary needs. 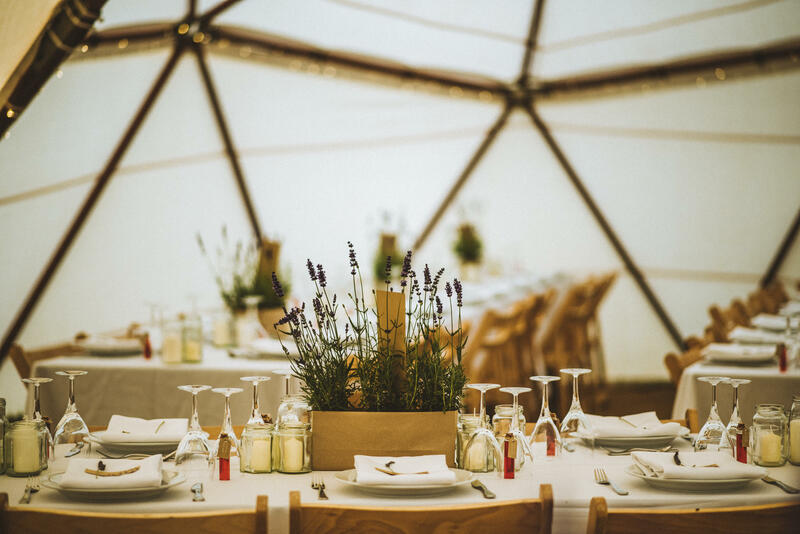 We are lucky enough to work with some of the finest chefs in the West Country who just happen to specialise in wedding catering, including Josh Eggleton (chef patron of the award-winning Pony & Trap, Andy Spooner (owner of The Full Spoon) and Kate Kingdon (owner of Bumblebee Foods). 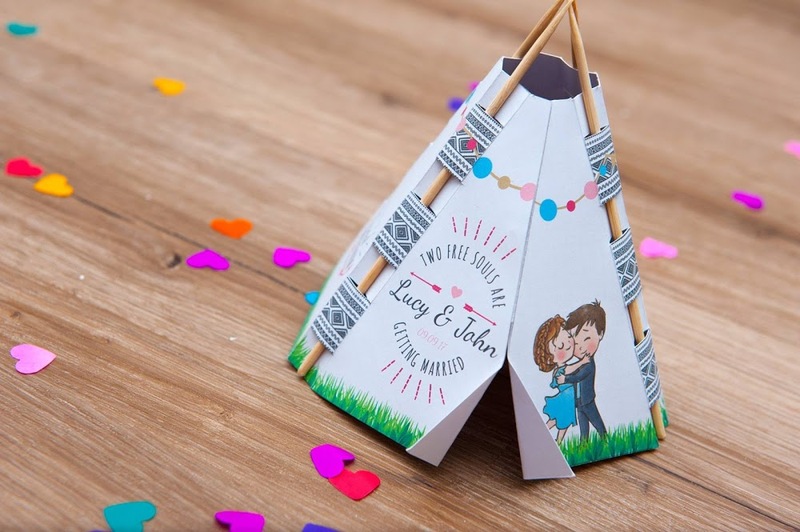 We would love to share our inspiration with you and create a unique package for your tipi festival wedding. Please do get in touch to find out more about Chew Valley Weddings.